Built around a large-format 4K version of the original ALEXA sensor, the ARRI ALEXA Mini LF (LPL) camera in this Ready to Shoot V-Mount Set offers native 4K recording in three sensor modes, with ARRIRAW or ProRes recording in LF Open Gate, LF 16:9, or LF 2.39:1 modes. The ALEXA Mini LF combines large-format resolution with an optimal pixel size for excellent image quality producing vivid, nuanced images with natural skin tones and smooth bokeh. The ALEXA Mini LF is designed with ARRI's LPL lens mount that has been optimized for large-format capture and is compatible with all PL-mount lenses with the use of a PL-to-LPL adapter. A wider diameter and shorter flange focal depth than the original ARRI PL mount enable LPL-mount lenses to be smaller and lighter than earlier large-format optics. The ALEXA Mini LF is a hybrid of the ALEXA Mini and the ALEXA LF, as it retains the same LF sensor but has the form factor of the Mini. The new exterior has a left-side media bay with two rows of connectors on the back and a slot to insert 1TB Codex media. It also features six user buttons, three more than the Mini, to configure to your preference. It also features extra 12 and 24V power outputs and a black burst/tri-level input. The audio connector is now 6-pin, so it doesn't conflict with the 5-pin timecode port. 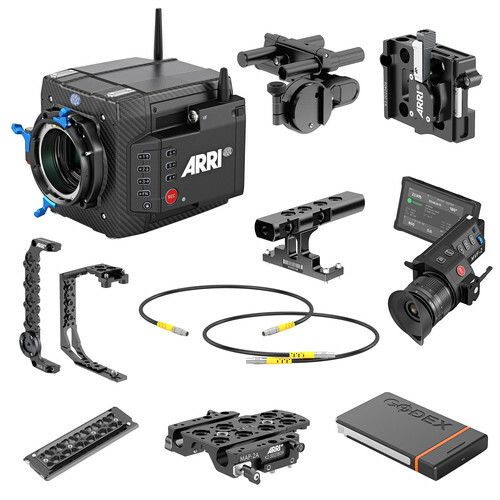 This Ready to Shoot V-Mount Set includes everything you need to get up and shooting with the ALEXA Mini LF such as the PL-to-LPL adapter, two 1TB Codex drives, a viewfinder, side and rear brackets, accessory and bridge plates, a V-mount battery power splitter box, and connection cables. Read more about the included items below. Like the entire ALEXA line, the ALEXA Mini LF combines high resolution with an optimal pixel size for excellent image quality. The ALEXA LF offers a choice of recording in 4448 x 3096 Open Gate, 3840 x 2160 16:9, and 4448 x 1856 2.39:1 anamorphic. The ALEXA Mini LF records vivid, nuanced images with natural-looking skin tones in native 4K. Its colorimetry is compatible with HDR (High Dynamic Range) and WCG (Wide Color Gamut) workflows, providing a subtle, immersive look. Recording rates (using Codex capture drives) range from 40 fps MXF ARRIRAW to 40 fps MXF ProRes 4444 XQ in LF Open Gate, 90 fps MXF ARRIRAW to 60 fps MXF ProRes 4444 XQ in LF 16:9, and 60 fps MXF ARRIRAW to 60 fps MXF ProRes 4444 XQ in LF 2.39:1 anamorphic. MXF ARRIRAW and MXF ProRes 444 XQ/4444/422 HQ/422 options are available in all three sensor modes. A base sensitivity of ASA 800, reduced noise, and a dynamic range of 14+ dovetails with HDR workflows. The LPL lens mount, designed specifically for large-format sensors, is integrated into the ALEXA Mini LF. With its wider diameter and shorter flange focal depth than the original ARRI PL mount, LPL-mount lenses can be designed smaller and lighter than earlier large-format optics. ARRI now offers a range of 16 large-format, LPL-mount Signature Prime lenses, ranging from 12 to 280mm. These separately available lenses display natural skin tones, smooth bokeh, and an organically pleasing look. The Signature Primes feature ARRI's quick and comprehensive LDS-2 lens metadata system and are constructed with machined magnesium for durability and lighter weights. The ALEXA Mini LF camera works with existing ALEXA-compatible lenses, accessories, and workflows. Use your favorite existing ARRI Look files and software tools with the ALEXA Mini LF. A separately available PL-to-LPL mount adapter attaches to any PL-mount lens, both Super 35 or full-frame. The ALEXA Mini LF transmits data from LDS-2, LDS-1, or /i (Cooke) lens data systems. The ALEXA Mini LF features the same integrated Wi-Fi and wireless video transmitter as the ALEXA SXT W, providing quick compatibility with the included WVR-1 wireless video receiver, as well as ARRI's various ECS (electronic lens/camera control system) components. This built-in wireless system saves build time on set, reduces cable mess, and saves weight on your camera rig. Built-in Large-Format Full-Spectrum Neutral Density (LF FSND) filters can be changed between ND 0.6, 1.2, and 1.8. Play back your MXF ARRIRAW or MXF ProRes clips from the ALEXA Mini LF.